For other people named David Henderson, see David Henderson (disambiguation). David Lee "Dave" Henderson (July 21, 1958 – December 27, 2015), nicknamed "Hendu", was an American professional baseball player. He played in Major League Baseball (MLB) for the Seattle Mariners, Boston Red Sox, San Francisco Giants, Oakland Athletics, and Kansas City Royals during his 14-year career, primarily as an outfielder. Henderson is best remembered for the two-out, two-strike home run he hit in the top of the ninth inning in Game 5 of the 1986 American League Championship Series. He helped his teams reach the World Series four times during his career – Boston in 1986, and Oakland from 1988 to 1990, with Oakland winning the championship in 1989. His uncle Joe Henderson appeared in 16 MLB games as a pitcher during the mid-1970s. Henderson was born in Merced, California, and grew up in nearby Dos Palos, where he attended high school and played both baseball and football. With the football team, which won championships in 1975 and 1976, he played tight end, running back, and strong safety. One of his baseball teammates was future College World Series MVP Stan Holmes, and the team won championships in 1976 and 1977. Henderson's uniform numbers – 42 in football, 22 in baseball – were both retired by the Dos Palos Broncos, who inducted him into the school's Hall of Fame in 2012, and named their baseball field in his honor. Henderson was selected by the Seattle Mariners in the first round of the 1977 Major League Baseball draft. His first professional season was 1977, with the Bellingham Mariners of the Class A short season Northwest League, where he played in 65 games, batting .315 with 16 home runs and 63 runs batted in (RBIs). Henderson's next two seasons were spent in the Class A California League. In 1978 he was with the Stockton Mariners, batting .232 with seven home runs and 63 RBIs in 117 games, and in 1979 he was with the San Jose Missions, batting .300 with 27 home runs and 99 RBIs in 136 games. In 1980, Henderson moved up to Class AAA, playing with the Spokane Indians of the Pacific Coast League, where he played in 109 games, batting .279 with seven home runs and 50 RBIs. Entering the 1981 season, Henderson was named to the major league team, and he was the Mariners' starting centerfielder on Opening Day, going hitless in four at bats. His first MLB hit came several games into the season – a home run against Oakland pitcher Steve McCatty, after Henderson had been hitless in his first nine major league plate appearances. He struggled at the plate throughout the season – at the end of April he was batting .135, which improved only slightly to .172 at the end of May. After then going 1-for-10 at the start of June, he was sent back down to Spokane in Class AAA. Henderson spent much of the summer with Spokane, appearing in 80 games while batting .279 with 12 home runs and 50 RBIs. In early September he was recalled, with his first appearance back with the Mariners coming on September 3, in a 20-inning game against the Red Sox, one of the longest MLB games ever played. From when he was recalled until the end of the season, he appeared mostly as a late-innings defensive replacement, finishing his first MLB year with a .167 average in 59 games played, with 6 home runs at 13 RBIs. During the 1982 season, Henderson's playing time increased significantly, as he appeared in 104 games, with 85 complete games played (all in center field). He batted .253 for the season, with 14 home runs and 48 RBIs. In 1983 his batting average improved to .269 with 17 home runs and 55 RBIs, while appearing in 137 games, with 124 of them being complete games in the outfield (78 in center field and 46 in right field). Henderson spent some of the 1984 season on the disabled list, due to a hamstring injury. Still, he hit well, batting .280 with 14 home runs and 43 RBIs, in 112 games played with 78 complete games in the outfield (all but 9 in center). His batting average dropped somewhat in 1985, as he hit .241 with 14 home runs and 68 RBIs, while appearing in 139 games with 117 of them being complete games in the outfield (all but 12 in center). Early in the 1986 season, Roger Clemens of the Red Sox became the first pitcher to record 20 strikeouts in a nine-inning game, which he accomplished in a game at Fenway Park against the Mariners, with Henderson being three of his strikeouts. Henderson struggled at the plate early in the season, batting below .200 as late as May 25. By the end of June he had improved to .250, and he was batting .272 at the end of July. Overall, Henderson played with Seattle for parts of six seasons, appearing in a total of 654 games, while batting .257 with 79 home runs and 271 RBIs. On August 19, 1986, the Red Sox, atop the American League East division, traded for Henderson and Mariner shortstop Spike Owen, sending Rey Quiñones, Mike Brown, Mike Trujillo, and a player to be named later to Seattle. Henderson was acquired to backup Boston center fielder Tony Armas. At the time of the trade, Henderson was batting .276 with 14 home runs and 44 RBIs, having appeared in 103 games. Henderson joined the 1986 Red Sox on August 19, and appeared in 36 games over the remainder of the regular season, with just 7 complete games (all in center field). Most of his appearances were as a late-game defensive replacement in center field, or as a pinch hitter – he had only 51 at bats, collecting 10 hits (.196 average) with one home run and three RBIs. The Red Sox finished the season on top of the American League East – 5½ games ahead of the New York Yankees – and would face the winners of the American League West, the then California Angels, in the American League Championship Series (ALCS). Henderson is best remembered for the two-out, two-strike home run he hit in the top of the ninth inning in Game 5 of the 1986 ALCS. At the time, the Angels were playing at home and were ahead in the series 3 games to 1 over the Red Sox. Henderson had appeared in Game 2 and Game 4 as a late-innings defensive replacement for Tony Armas, and was hitless in one at bat. In Game 5, Armas sprained his ankle in the second inning, and was replaced by Henderson, who entered the game to play centerfield in the bottom of the fifth inning. With the Red Sox leading 2–1 in the sixth inning, the Angels had a man on second with two-out, when Bobby Grich hit a deep fly ball that Henderson attempted to catch on the warning track – the ball deflected off his glove and went over the wall, giving Grich a two-run home run. The Angels now had a 3–2 lead, with Henderson the likely scapegoat, should the Red Sox lose the game. Henderson batted in the seventh inning and struck out, while the Angels added two more runs in their half of the seventh. The Angels tied the game 6–6 in the bottom of the ninth, and the game went into extra innings. In the top of the 11th, the Red Sox loaded the bases with no outs, and Henderson hit a sacrifice fly that Baylor scored on, which put the Red Sox ahead 7–6 and proved to be the margin of victory. Still down 3 games to 2 in the series, the Red Sox returned home to Fenway Park for the final two games, where they defeated the Angels 10–4 and 8–1 to capture the AL pennant. Henderson played center field for both of those games – collecting a walk and a run in each game, but going hitless – as Armas' injury kept him from playing. For the ALCS, Henderson finished 1-for-9 at the plate, with his only hit being the season-saving home run in Game 5. Henderson was the Red Sox' centerfielder throughout the 1986 World Series, as Tony Armas was sidelined by the injury he had sustained in the ALCS; Armas made only a single appearance, as a pinch hitter. Henderson hit .400 (10-for-25) in a losing cause, as the Red Sox were defeated by the New York Mets in seven games. Henderson hit two home runs – the first during the Red Sox' 9–3 win in Game 2, and the second came in the 10th inning of Game 6, giving the Red Sox a 4–3 lead in a game they would go on to lose 6–5. Henderson was Boston's starting center fielder for the first month of the 1987 season, and during April he hit .239 (17-for-71, also 18 strikeouts) with 3 home runs and six RBIs. On April 30, the Red Sox called up rookie Ellis Burks from their minor league system, and Burks took over as the regular center fielder. Henderson saw his playing time decrease as he primarily played corner outfield positions, along with pinch hitting. At the end of May he was hitting .240, then he struggled during June, dropping to a .206 average. After having only 6 at bats in July, he received more playing time in August and raised his season totals to a .234 average with 8 home runs and 25 RBIs, but on September 1 the Red Sox traded him to the San Francisco Giants for a player to be named later (ultimately, Randy Kutcher). Over parts of two seasons with Boston, Henderson played in 111 regular season games, batting .226 with nine home runs and 28 RBIs. Henderson spent the final month of the 1987 season with San Francisco, where he appeared in 15 games, batting for a .238 average. While the Giants won the National League West and were in the 1987 National League Championship Series, Henderson was acquired hours past the postseason roster deadline, thus was not eligible to play for the Giants in the playoffs. After the season, Henderson was granted free agency. Henderson signed as a free agent with Oakland before the 1988 season, following his brief stint with the Giants. He was the Athletics' starting center fielder on Opening Day, and appeared in a total of 146 games, including 127 complete games in center field. His performance proved to be one of the season's biggest surprises as he set career highs in batting average (.304), runs (100), hits (154), doubles (38), RBIs (94), and slugging percentage (.525). He also hit 24 home runs, and the Athletics were 23–1 when he homered. Henderson received consideration during AL MVP voting and finished 13th, with the award going to his Athletics teammate Jose Canseco. The Athletics finished the season with a 104–58 record, and won the American League West by 13 games over the Minnesota Twins. In the 1988 ALCS, the Athletics faced the Red Sox and swept them in four games. Henderson batted 6-for-16 (.375) with one home run and four RBIs during the ALCS. The Athletics advanced to the 1988 World Series where they lost to the Los Angeles Dodgers in five games, including their Game 1 loss on Kirk Gibson's famous home run. Henderson batted 6-for-20 (.300) with one RBI. Overall in the 1988 postseason he batted 12-for-36 (.333) with one home run and five RBIs, and he played center field for all of Oakland's games. In 1989 Henderson was again the team's primary center fielder, playing 134 complete games, and appearing in a total of 152 games during the season. His hitting wasn't as good as the prior year, as he batted .250 (down from .304) and had 131 strikeouts (up from 92). He had 15 home runs and 80 RBIs. The Athletics had a 99–63 record to win the AL West again, finishing 7 games ahead of the Kansas City Royals. In the 1989 ALCS the Athletics beat the Toronto Blue Jays in five games. Henderson hit 5-for-19 (.263) with one home run and one RBI during the ALCS. Oakland faced the San Francisco Giants in the 1989 World Series and swept them in four games, although those games were played over a period of two weeks due to the 1989 Loma Prieta earthquake before the start of Game 3. Henderson hit 4-for-13 (.308) with two home runs and four RBIs during the series. For the 1989 postseason his batting average was .281 (9-for-32) with three home runs and nine RBIs, and he played center field throughout. This championship proved to be the only one of Henderson's MLB career. The 1990 season again found Oakland winning the AL West, this year with a 103–59 record, finishing ahead of the Chicago White Sox by 9 games. Henderson batted .271 with 20 home runs and 63 RBIs, while appearing in 127 games, including 100 complete games in center field. He missed 27 games between August 20 and September 21, due to torn cartilage in his right knee. Oakland met the AL East winning Red Sox in the 1990 ALCS and swept them in four games, as they had done two years prior. Oakland had Willie McGee in center field in the first two games, with Henderson playing the last two games. During those two games, Henderson batted 1-for-6 (.167) with one RBI. Oakland was unable to repeat as champions, being swept in four games by the Cincinnati Reds in the 1990 World Series. Henderson batted 3-for-13 (.231) without a home run or RBI. Oakland used McGee in center field in Game 1, with Henderson playing the other three games. Overall for the postseason, Henderson hit .211 (4-for-19) with one RBI and without a home run. During the first half of the 1991 season, Henderson hit well, batting .298 with 18 home runs and 50 RBIs, and was selected for the 1991 All-Star Game with over 1.5 million fan votes. He started the All-Star Game for the AL in right field, and was 0-for-2 at the plate before being pinch hit for by Rubén Sierra in the sixth inning. In August, Henderson hit three home runs in a single game, in a losing effort against the Minnesota Twins, with all three coming in consecutive at bats off of starting pitcher David West. Henderson's average dipped in the second half of the season and he finished the year at .276 with 85 RBIs and a career-high 25 home runs. The Athletics finished with a 84–78 record, 4th place in the AL West. Henderson had problems with a badly strained right hamstring throughout the 1992 season, which limited him to just 20 games played, and caused him to miss 104 consecutive games between May 5 and the start of September. He hit just 9-for-63 (.143) for the season, with 2 RBIs. While Oakland won the AL West (then lost to Toronto in six games in the 1992 ALCS), Henderson was left off of the postseason roster due to his injury. For the 1993 season, Henderson appeared in 107 games, including 54 complete games in the outfield and 26 starts as designated hitter (DH). He batted .220 with 20 home runs and 53 RBIs. The Athletics finished the season with a 68–94 record, last place in the AL West. After the season ended, Henderson became a free agent. Overall, Henderson spent six seasons with Oakland, batting .263 with 104 home runs and 377 RBIs. His time with Oakland included the only All-Star Game and the only World Series championship of his career. Before the start of the 1994 season, Henderson was signed as a free agent by the Kansas City Royals, as the club intended to platoon him with Bob Hamelin. For the first month of the season Henderson was the Royals' regular right fielder, however he only hit 9-for-47 (.191) with 2 home runs and 8 RBIs. Over the coming months he appeared more as DH and was not an everyday player. Through late July he was hitting .247 with 5 home runs at 31 RBIs, having appeared in only 56 of the team's 103 games. Shortly after his 36th birthday, Henderson retired on July 29, 1994, which was his last MLB appearance – against the Minnesota Twins, he played the final two innings of the game as a defensive replacement in left field. During his 14 MLB seasons, Henderson appeared in 1538 games, batting .258 with 197 home runs and 708 RBIs. Defensively, he played 1388 games in the outfield (1157 in center field), with a .984 fielding percentage. Henderson was married twice, and had two sons, one of whom is affected by Angelman syndrome, which Henderson worked to raise research funding for. After retiring as a player, Henderson lived in the Seattle area and remained involved in baseball as an agent, broadcaster, and running fantasy camps. He also co-founded a charity that provides Christmas gifts to children. From 1997 to 2006, Henderson worked as a color commentator during Mariners radio and television broadcasts. He returned to the Mariners' radio booth during 2011 and 2012 as one of a rotating crew of part-time announcers working with Rick Rizzs who succeeded the deceased Dave Niehaus. Henderson suffered a heart attack and died at Harborview Medical Center in Seattle on December 27, 2015, approximately one month after having undergone a kidney transplant. 1 2 Crehan, Herb (January 1, 2016). "Remembering Dave "Hendu" Henderson". Boston Baseball History. Retrieved October 28, 2016. 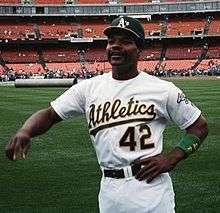 1 2 3 4 5 "Former Dos Palos, A's star Dave Henderson dies". Merced Sun-Star. December 27, 2015. Retrieved October 31, 2016. ↑ "California Angels 6, Seattle Mariners 2". Retrosheet. April 9, 1981. Retrieved October 31, 2016. ↑ "Oakland Athletics 16, Seattle Mariners 1". Retrosheet. April 17, 1981. Retrieved October 31, 2016. ↑ "Game Length Records". Baseball Almanac. Retrieved October 31, 2016. ↑ "Boston Red Sox 3, Seattle Mariners 1". Retrosheet. April 29, 1986. Retrieved November 1, 2016. ↑ Muskat, Carrie (August 19, 1986). "A technicality left shortstop Spike Owen and outfielder Dave...". UPI. Retrieved November 5, 2016. ↑ Elderkin, Phil (October 28, 1986). "Seattle-to-Boston trade definitely agreed with two Sox stars". Christian Science Monitor. Retrieved November 1, 2016. ↑ Rosaforte, Tim (October 15, 1986). "Armas` Ankle Isn`t Sox`s Achillies` Heel". SunSentinel. Retrieved November 1, 2016. ↑ "ALCS Gm5: Grich's homer tips off Henderson's glove". YouTube. MLB. December 17, 2013. Retrieved October 31, 2016. ↑ McCullough, David (December 28, 2015). "A Tribute To Dave Henderson". Sons of Sam Horn. Retrieved October 31, 2016. ↑ "1986 ALCS Gm5: Henderson's series changing homer". YouTube. MLB. January 28, 2015. Retrieved October 31, 2016. ↑ Donaldson, Jim (November 21, 2013). "Al Michaels eager to call another Brady-Manning game". Providence Journal. Retrieved November 2, 2016. ↑ "Boston Red Sox 7, California Angels 6". Retrosheet. October 12, 1986. Retrieved October 31, 2016. ↑ "Tony Armas Postseason Batting Gamelogs". Baseball Reference. Retrieved November 2, 2016. ↑ "Boston Red Sox 9, New York Mets 3". Retrosheet. October 19, 1986. Retrieved November 2, 2016. ↑ "New York Mets 6, Boston Red Sox 5". Retrosheet. October 25, 1986. Retrieved November 2, 2016. 1 2 Rushin, Steve (May 6, 1991). "The Fans' Man". SI.com. Retrieved November 5, 2016. 1 2 Paloma, Richard (November 10, 2015). "Oakland Athletics: Acquisitions That Built The Pennant Winning 1988-1990 Team". White Cleat Beat. Retrieved October 31, 2016. ↑ Smith, Claire (July 10, 1991). "The Other Henderson Finally Gets a Salute". New York Times. Retrieved November 5, 2016. ↑ "American League 4, National League 2". Retrosheet. July 9, 1991. Retrieved November 5, 2016. ↑ "Minnesota Twins 8, Oakland Athletics 6". Retrosheet. August 3, 1991. Retrieved November 5, 2016. 1 2 Schmuck, Peter (October 7, 1992). "Dave Henderson scratched from series". Baltimore Sun. Retrieved November 5, 2016. ↑ Rieper, Max (December 22, 2006). "Retro Corner: A Look Back at 1994". Scout.com. Retrieved November 5, 2016. ↑ "American League Players Who Retired in 1994". Baseball Almanac. Retrieved November 5, 2016. ↑ "Kansas City Royals 5, Minnesota Twins 3". Retrosheet. July 29, 1994. Retrieved November 5, 2016. 1 2 3 Hickey, John (December 27, 2015). "Former A's standout Dave Henderson dies at 57". The Mercury News. Retrieved November 7, 2016. 1 2 3 "Beloved Mariners player, broadcaster Dave Henderson dies". KIRO7.com. December 27, 2015. Retrieved November 7, 2016. ↑ "About Us - Rick's Toys for Kids". rickstoysforkids.org. Retrieved November 7, 2016. ↑ Eaton, Nick (October 22, 2012). "Who should be Rick Rizzs' full-time radio partner for the Mariners?". seattlepi.com. Retrieved November 7, 2016. ↑ Stone, Larry (December 1, 2011). "Mariners continue announcer rotation on TV, radio for 2012". The Seattle Times. Retrieved November 7, 2016. ↑ McGuire, Justin (December 27, 2015). "Dave Henderson, 1986 ALCS hero for Red Sox, dies at 57". sportingnews.com. Retrieved December 27, 2015. ↑ Divish, Ryan (December 28, 2015). "Former Mariners outfielder and broadcaster Dave Henderson passes away at age 57". The Seattle Times.